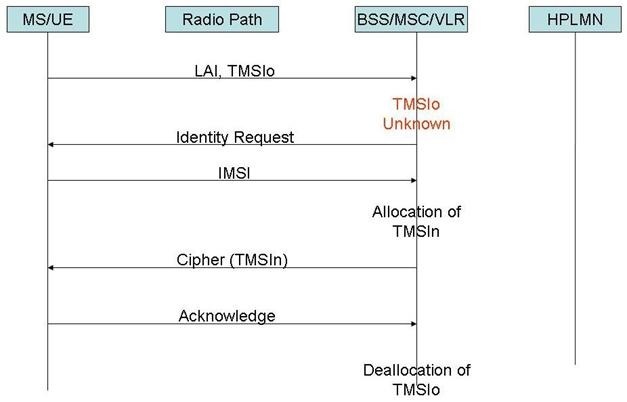 The IMSI is the permanent identity of the USIM/Subscriber in the UMTS network. Subscriber’s IMSI should not be compromised on the radio link. The presence or arrival of a subscriber in a specific area can not be determined by eavesdropping on the radio access link. The intruder should not know whether different services are provided to the same user. 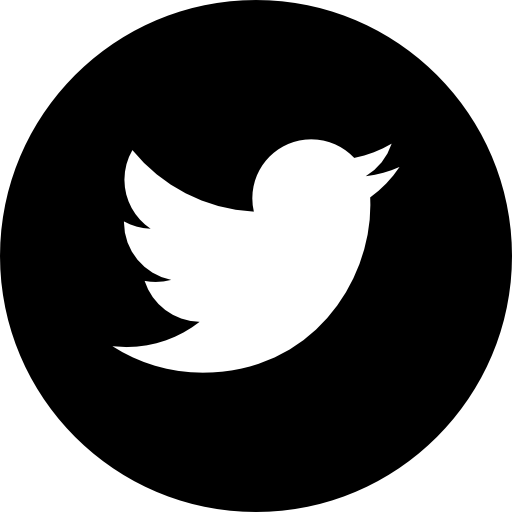 The user should not be identified by the same identity for longer period of time. The signaling and user data that might reveal the user’s real identity should always be ciphered. MCC defines the home country where the subscriber is registered. 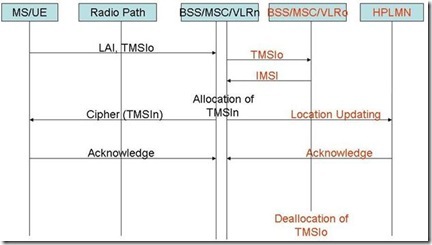 MNC code defines the home GSM PLMN of the mobile subscriber. 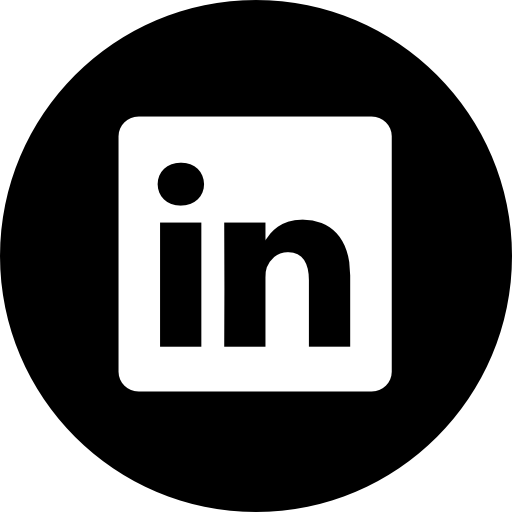 This number is used to identify a subscriber within the PLMN. TMSI changes when user changes the location area. 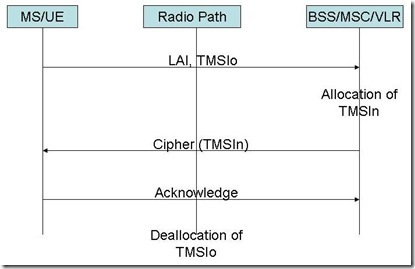 TMSI is a local number and has a meaning only in a certain location area. 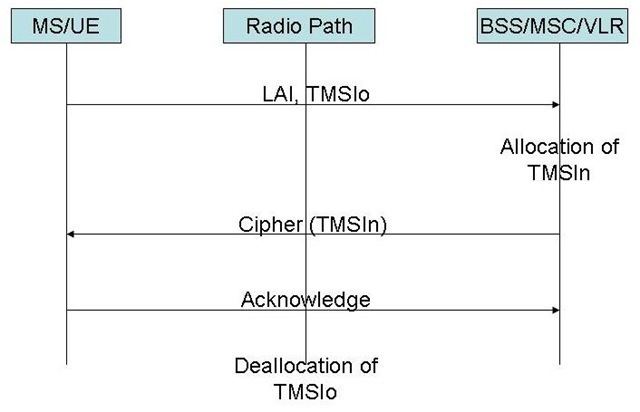 TMSI is always accompanied by a LAI (Location area Identity) to avoid ambiguities. 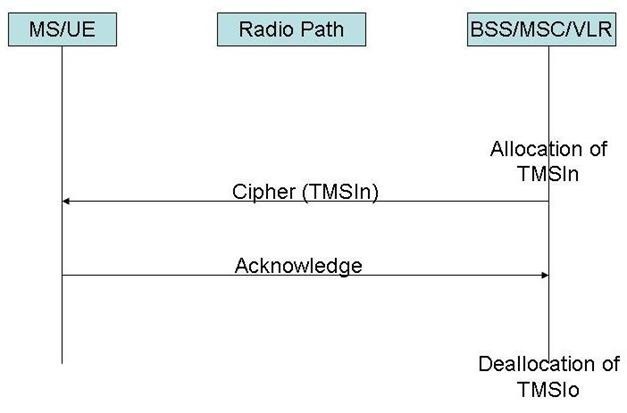 In the core network the VLR keeps the relation between IMSIs and TMSIs in a database. 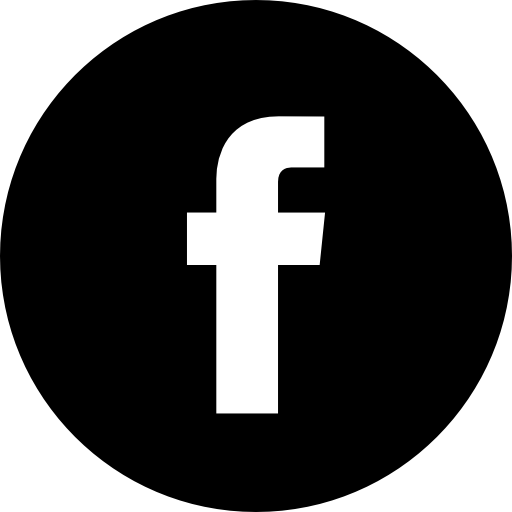 There are number of different instances when TMSI is changed or recalculated. In this case both the old location area and the new location area are part of the same MSC. Step 1: UE starts the location area procedure with content set for LAI and old TMSI (TMSIo). 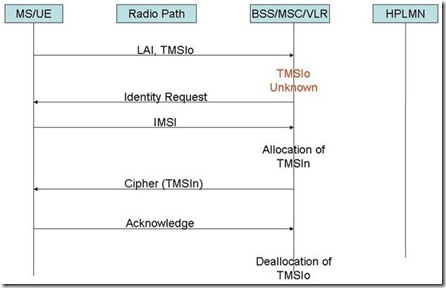 Step 2: MSC/VLR calculates the new TMSI (TMSIn). Step 3: TMSIn is transferred to UE in ciphered text to maintain the confidentiality. Step 4: UE acknowledges the change of TMSI. Step 5: Old TMSI (TMSIo) will be de-allocated from the VLR database. In this case the VLR of the old location area is same as that of the old location area but the MSC changes. Step 3: TMSIn is transferred to UE in ciphered text to maintain the confidentiality. HPLMN is also informed about the change of location area. Step 4: UE acknowledges the change of TMSI. HPLMN also acknowledges the changes. 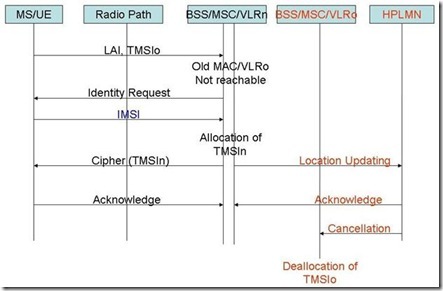 Step 1: UE request location update request with old TMSI (TMSIo) and old LAI set. Step 2: The new MSC/VLR send the TMSIo to the old MSC/VLR. Step 3: Old MSC/VLR responds with sending back IMSI of the UE. Step 4: The new MSC/VLRn calculates the new TMSI (TMSIn). Step 5: MSC/VLRn sends TMSIn to UE in ciphered text and inform the HPLMN of the UE. Step 6: Both UE and HPLMN acknowledges the new MSC/VLRn. Step 7: The old MSC/VLRo deallocates the TMSIo from its database. This is the case when the old VLR of the UE is not reachable by the new VLR. Step 2: The new MSC/VLRn can not reach the old MSC/VLRo. Step 3: New MSC/VLRn request UE for identity with Identity Request message. 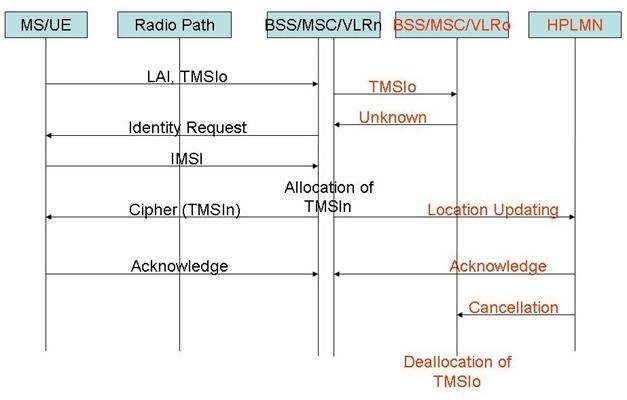 Step 4: UE sends IMSI to the new MSC/VLR in clear text. Step 5: The new MSC/VLRn calculates the new TMSI (TMSIn). Step 6: MSC/VLRn sends TMSIn to UE in ciphered text and inform the HPLMN of the UE. Step 7: Both UE and HPLMN acknowledges the new MSC/VLRn. Step 8: The old MSC/VLRo deallocates the TMSIo from its database. This procedure is initiated by the NW to change the TMSI of the UE. The initiation of the procedure depends on operator. The de-allocation of the old TMSI (TMSIo) only happens when UE acknowledges that the new TMSI (TMSIn) is allocated. This procedure happens when there is data loss in the VLR after location update request. 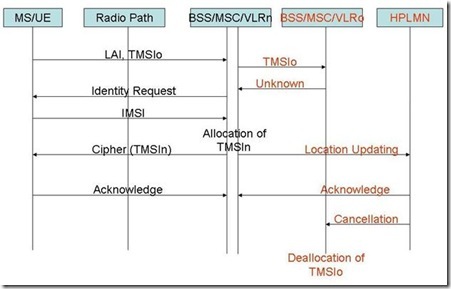 Step 3: Old MSC/VLR does not have the TMSI. It responds that the TMSIo is unknown to it. Step 4: New MSC/VLRn sends Identity request to the UE. Step 5: UE responds with sending the IMSI in clear text. 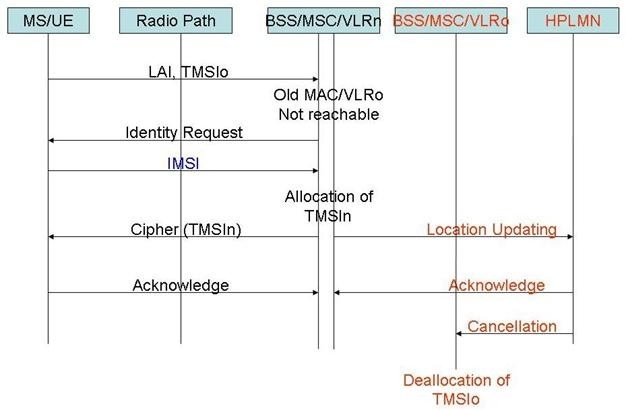 Step 6: The new MSC/VLRn calculates the new TMSI (TMSIn). Step 7: MSC/VLRn sends TMSIn to UE in ciphered text and inform the HPLMN of the UE. Step 8: Both UE and HPLMN acknowledges the new MSC/VLRn. Step 9: The old MSC/VLRo deallocates the TMSIo from its database. 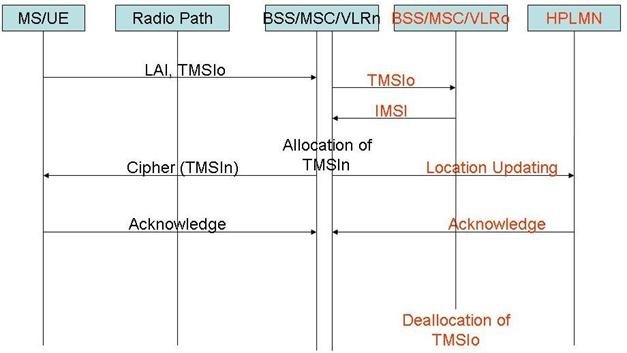 If due to some problem the MS/UE does not acknowledge the allocation of new TMSI then the network will maintain the relationship between the old TMSI and IMSI and between the new TMSI and IMSI. it is great tutorial ! 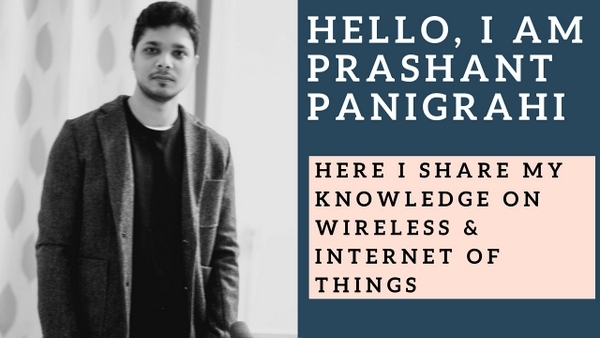 It is a nice article.